Today we reached a temperature high around 64F. There winds were out of the southeast at 9-12 mph. We did have some rain move in this afternoon and it was very heavy at times. Look for a cool down tomorrow. There is no surf fishing report for today. There is no inshore fishing report for today. There were some blackfin and yellowfin tuna, along with a few amberjack caught offshore today. Formulated to meet the requirements of both high and low temperature applications where grease is the preferred lubricant. Use on main gears, crank gear, pinion gear and bushings. Today we had sunny skies and calm winds. The winds were from the north-east at 5-10 mph and the temperatures were in the upper 80’s. Today the sea mullet and pompano bite was good on the Avon and Buxton beaches. 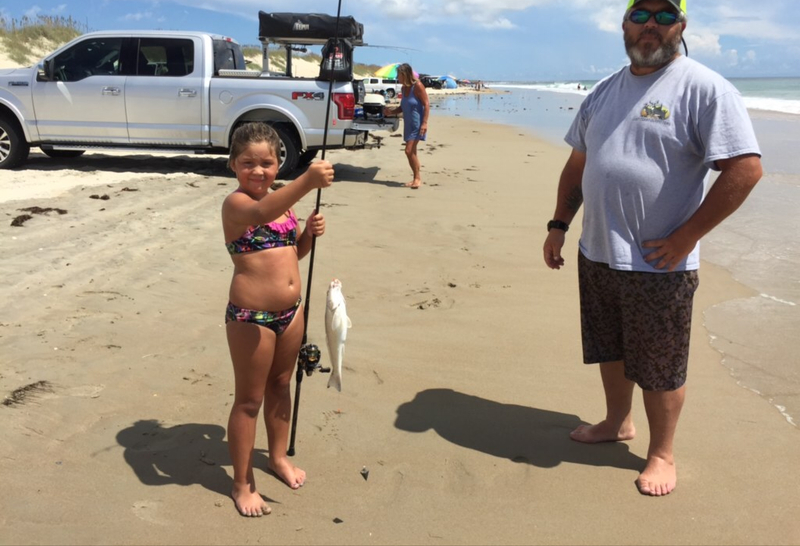 Over on the Frisco and Hatteras beaches sea mullet, pompano and some flounder were caught. The inshore boats caught lots or citation red drum and bluefish in the Pamlico Sound. . The offshore boats caught dolphin and blackfin tuna. 3 sailfish were released. Some nice trigger fish were caught of the bottom. Improved Shock CollarTM Technology. Large .039″ Leading Edge Blade. Tough, Razor Sharp .035″ Stainless Steel Blades. 2″ Cutting Diameter. Includes Free Practice Head. 100 Grain. What a way to end the holiday, we had beautiful weather today. The winds were variable, blowing between 5 & 10 mph and the temperatures were in the upper 80’s. Today there have been bluefish and spanish mackerel this morning at the Point area. There have also been bluefish, sea mullet and small flounder. The bluefish are liking pink today. There was a cobia reported being caught off the surf in Hatteras. Pictured below is Morgan Swain with a nice sea mullet, she caught today on the Frisco beach. The inshore boats had some catches of red drum and bluefish. The offshore boats had catches of blackfin tuna, amberjack, sea bass and dolphin. Some boats had their limits of dolphin. There were also a couple of blue marlin releases, with a few more seen. Features BAK-4 prisms to allow maximum light transmission and have high contrast, amber multi-coated optics. O-rings sealed and nitrogen-purged for waterproof and fogproof protection. Features long eye relief and twist-up eyecups for eyeglass wearers. Ribbed and groved dark green rubber armoring ensures a secure grip even while wearing gloves. Today we had calm winds with mostly sunny skies. The winds were from the west at 5-10 mph and the temperatures were in the upper 70’s. Up on the Avon beach bluefish, sea mullet, pompano and a few small flounder were reported. On the Buxton beaches sea mullet and bluefish were caught. Over on the Frisco and Hatteras beaches bluefish, sea mullet and a few pompano were reported. The inshore boats had catches citation red drum in the Pamlico Sound today. The offshore boats had good wahoo fishing and a few dolphin were caught. **Please remember that clamming is closed temporarily. Little Dippers life jackets allow free range of motion and great stability while in the water, for kids between 30-50 lbs. They are a great confidence builder for kids who are just beginning to swim and play in the water. U.S. Coast Guard approved life jacket. Today we had temperatures in the low 80’s and partly cloudy skies. We did have a couple of showers here and there. The winds were out of the southwest at 15-5 mph. The fishing is slowly picking up. Avon had some spot and sea mullet. Yesterday there were a few puppy drum caught off the beach as well. Buxton had some sea mullet and pompano. Frisco had some bluefish, spot, pompano, sea mullet and a keeper flounder. Hatteras had nice size bluefish, sea mullet and a yearling size drum. The inshore boats had catches of bluefish, speckled trout and gray trout. Some offshore boats did make it out today. The bite was scattered with catches of wahoo, dolphin, triggerfish and amberjack. Braid’s Pro-Manta Harness, ideal for battling mid-size game fish, is made of quality materials and has welded stainless “D” rings to accommodate drop straps. Today we had a high around 87F. We started off with light southwest winds, that changed after lunch. The winds picked up to 13 mph, with some gusts to 20. Avon Pier is reporting pompano, spanish mackerel and bluefish. Buxton had sea mullet and pompano. Here in Frisco, we had pompano and sea mullet as well. Hatteras also had pompano. The inshore boats had great catches of spanish mackerel. The offshore boats had good catches of gaffer and bailer dolphin. The also had catches of amberjack and tilefish. There was a white marlin released and a couple of sailfish. Build: Interframe with Zytel scales. Color: Desert Tan with Bead Blast Blade. Blade: Combined Razor-Sharp and Triple-Point serrated cutting edge. Overall: 3.56″, Cutting edge 3.38″. 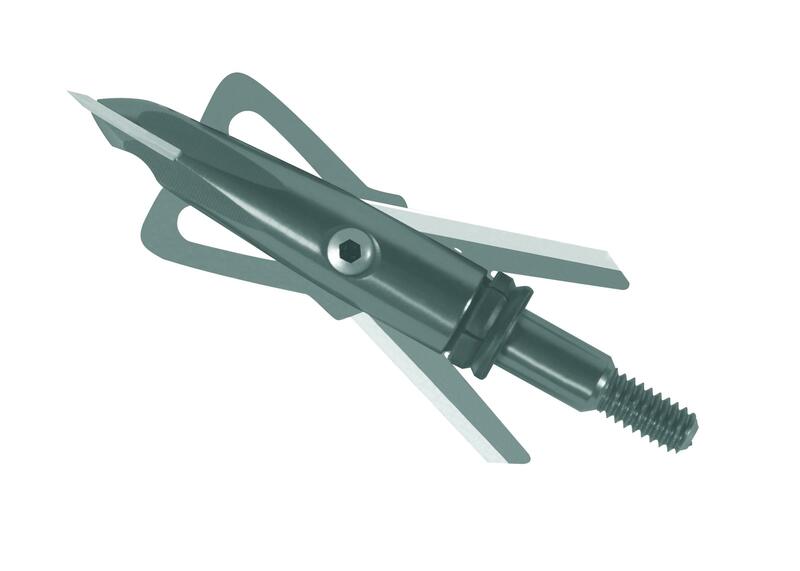 Handle: closed length 4.63″. Weight 3.5 oz. Today we had lots of rain. The winds were from the west switching to the north-west at 15-20 mph and the temperatures were in the low 60’s dropping to the upper 40’s late in the day. With the heavy rain all day and some thunder and lighting off and on no one went fishing that I know of. Built by Fishermen, for Fishermen: The Deck-Boss 15-inch Boot is engineered to be tough and durable, and is built with a rigid toe cap and an injection molded upper that eliminates delamination and cracking. Patented “Herkules Grip” synthetic rubber technology also provides superior traction on wet surfaces. 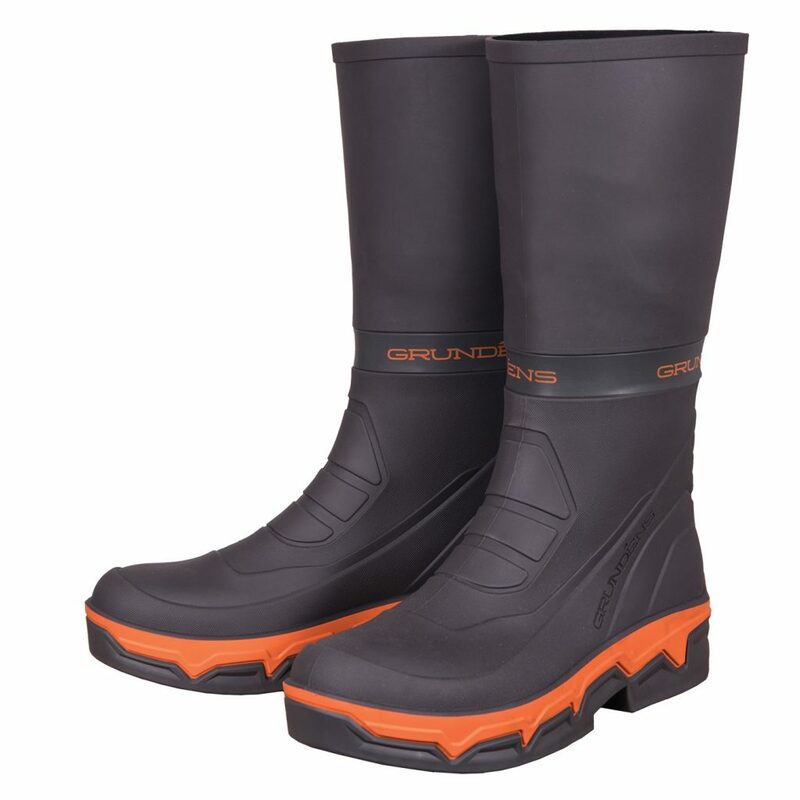 The flexible upper folds down when the full 15-inch height is not needed and a 1-inch groove holds a durable silicone band that keeps pants out of the muck and legs dry. Functional Comfort: The boot’s interior is a comfortable and functional patent-pending proprietary insole. Engineered to mimic the bilge space in a boat, the insole is comprised of two separate levels, or “decks.” The softer upper deck is perforated, allowing liquid to find its way to the bilge space and can be replaced with after-market insoles for a more customized fit. The lower deck sits on pilings that create bilge space for liquid to accumulate. There are scuppers around the perimeter of the lower deck to allow liquid to drain into the bilge space.